A Tri-State Generation and Transmission Association executive has been involved since 2005 with the Utility Air Regulatory Group (UARG), the anti-Clean Air Act group that is the subject of a US congressional investigation, raising questions about the amount of money that Tri-State has contributed to the group over the last 14 years. On Thursday, leaders of the US Congressional Committee on Energy and Commerce wrote to Tri-State and other utilities, requesting information and documents about the utilities' relationship with UARG, a secretive group that has played a key role in lawsuits aimed at rolling back Clean Air Act rules. Internal UARG documents obtained by Politico show that Tri-State contributed $167,418 to UARG in 2017. In their April 11 letter, congressional investigators asked Tri-State to "Please explain how your substantial annual contributions to UARG are consistent with your obligations to ratepayers." Congressional investigators are also seeking a variety of documents and information from Tri-State and other utilities by April 25, including "Membership and leadership nominations" and "Documents relating to the Policy Committee, including all documents relating to meetings thereof." A bio of Barbara Walz, Tri-State's Senior Vice President of Policy and Compliance, shows that she has been a member of UARG's Policy Committee since 2005, and a member of UARG's Steering Committee since 2010. 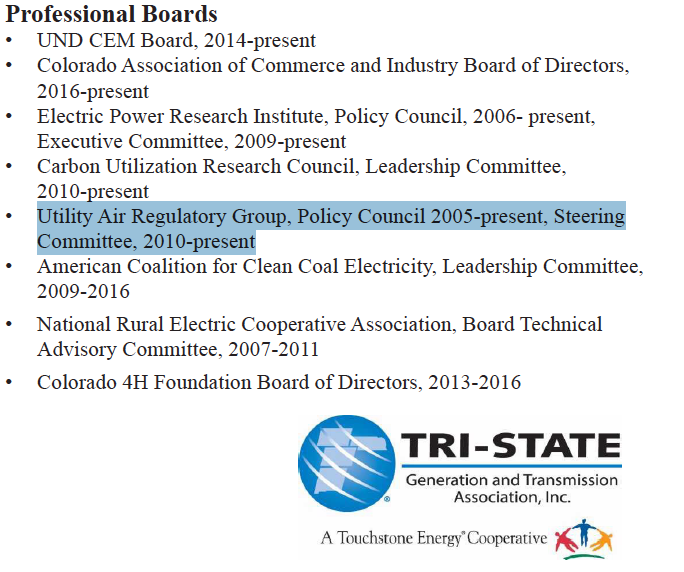 Leaders of the US Congressional Committee on Energy and Commerce wrote to Tri-State Generation and Transmission Association and other electric utilities today, requesting information about the utilities' relationships with the Utility Air Regulatory Group (UARG), a secretive lobby group focused on rolling back Clean Air Act rules. In the letter to Tri-State, Energy and Commerce Chairman Frank Pallone, Jr. (D-NJ), Environment and Climate Change Subcommittee Chair Paul Tonko (D-NY) and Oversight and Investigations Subcommittee Chair Diana DeGette (D-CO) wrote, “UARG has avoided any transparency, with details of its funding and internal organization only recently revealed. Your company contributed $167,418 in 2017 to fund UARG's activities, with a higher contribution projected for 2018." Because of Tri-State's funding of UARG and its legal challenges against Clean Air Act rules, the Energy and Commerce Committee leaders wrote to Tri-State to request information and documents as part of their investigation into UARG and its connections to senior US Environmental Protection Agency officials. Electric cooperatives in Colorado and New Mexico have built a growing number of renewable energy projects over the last several years as prices declined, but new data show that local renewable energy growth stalled in 2018 among the 43 co-ops that buy power from Tri-State Generation and Transmission Association. The stall in growth comes even as prices for solar projects have declined, and highlights the key role that Tri-State policies play on member co-ops. Some co-ops like United Power and La Plata Electric are restricted from pursuing more projects, because they reached the 5% limit that Tri-State imposes on local energy development. And Tri-State has also repeatedly changed the pricing for member co-ops' renewable energy projects in recent years under its Policy 115, in ways that have discouraged projects. In 2018, Tri-State also changed Policy 115 to include energy storage projects, which United Power said would cut in half the expected savings for its members from its 4 megawatt Tesla battery project. Overall, the recent policy changes show how Tri-State has moved to discourage its member co-ops from pursuing local solar and battery projects, just as those resources have become most economically attractive. According to Tri-State's 2018 10-K, which was filed with the Securities and Exchange Commission last month, 21 member co-ops had contracted for a total of 139 megawatts of local energy projects by the end of 2018. That marked a decline from the 143 megawatts noted in Tri-State's 2017 10-K, a significant change after years of growth. Tri-State reported 113 megawatts of member co-ops' local energy projects in its 2016 10-K. But Tri-State officials didn't mention the recent decline of its member co-ops' renewable energy projects during the first public meeting of its 2019 Integrated Resource Planning process last week, and instead described how "that number has really grown from when the first project came online about ten years ago." Tri-State also didn't mention the decline in a recent filing with the Colorado Public Utilities Commission. Last month, Tri-State Generation and Transmission Association began running its latest advertising campaign, which tells electric cooperatives they are "Better Together" with Tri-State. ​Now, a second co-op has done the same. A spokesperson for La Plata Electric confirmed that the co-op asked Tri-State to "refrain from using our logo" in the ad campaign. That link now directs to a page that says: "The requested page could not be found." 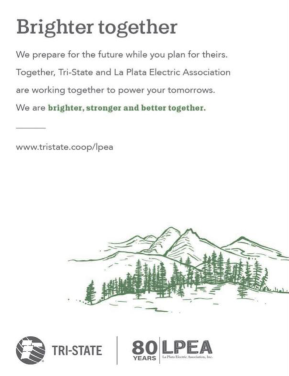 In both cases, Tri-State has continued to run "Better Together" ads in Mountain Parks Electric's and La Plata Electric's service territories, just with the local co-ops' names and logos removed from the ads. Tri-State "Better Together" ad with LPEA logo. Tri-State Generation and Transmission Association will hold its annual meeting during the first week of April, where member co-ops are expected to approve changes to Tri-State’s bylaws. But this year, members of the 43 electric cooperatives that buy power from Tri-State won’t be allowed to attend. Emails from Tri-State’s CEO and board president provided inconsistent explanations for why members would not be allowed to attend the annual meeting. In an email this week, Tri-State CEO Mike McInnes claimed that co-op members wouldn’t be allowed to attend “because of the growth we continue to have." I am both sorry and thrilled that we are needing to start limiting the attendance at our Annual Meeting because of the growth that we continue to have. In the past, we were able to be more flexible with the attendance and as you mentioned, you were able to attend. The 43 electric cooperatives that buy power from Tri-State Generation and Transmission Association are likely to approve changes to Tri-State's bylaws that would allow for new types of contracts between the co-ops and the wholesale power provider. In advance of the expected official vote on the bylaws amendments during Tri-State's upcoming annual meeting on April 1-4, the co-ops showed support for the proposal at a special meeting Tri-State held on March 6. In its 2018 10-K that was recently filed with the Securities and Exchange Commission, Tri-State said: "At a special meeting of our Members held in March 2019, our Members discussed the proposed amendments to the Bylaws and support such amendments." Tri-State's 10-K also makes clear that the changes to the bylaws won't lead directly to new types of contracts, but instead would "permit our Board to establish such additional classes of membership and the rights and privileges of the members of those additional classes." A copy of the proposed bylaw amendments also shows that they would allow, but not require, the Tri-State board of directors to create new membership classes. Those other membership classes are also not defined by the bylaw amendments. ​A group of more than 20,000 family farmers in Colorado, New Mexico and Wyoming is calling on Tri-State Generation and Transmission Association to provide more flexibility for its member co-ops and to "re-tool its existing resource plan so it calls for investment in clean, affordable, reliable alternatives." The ﻿resolution﻿ from Rocky Mountain Farmers Union notes that energy costs account for 7% of its members' expenses on average, and highlights how "dramatic changes in technology and market conditions have driven the cost of renewable energy generation sources well below carbon-based resources." Electric cooperatives deliver power to 42 million Americans, and those local co-ops tend to be well known in the communities they serve. At a minimum, people know who they write a check to each month, and some co-op members get more involved with their co-ops by running for the board of directors, attending meetings, and working to ensure that co-ops are upholding their commitments to democratic control. What’s less well known is that most electric cooperatives are themselves members of larger cooperatives, known as generation and transmission associations (or “G&Ts” within the industry). These generation and transmission associations own and operate large power plants and deliver that power to local electric cooperatives, which in turn distribute electricity to homes and businesses across the United States. Generation and transmission associations aren’t often well known because they don’t show up on electric bills. But they can have a major impact on local electric cooperatives’ power supply, rates, and even a co-op’s ability to respond to its members concerns. Will Municipal Energy Agency of Nebraska remain reliant on coal? A wholesale power provider for 13 Colorado cities and towns generates most of its power from coal - but will that still be true in 2030? That's one of the key the questions raised in a report published last month by Sustainable Development Strategies Group, ​"A Renewable Energy Future for Colorado Communities Served by the Municipal Energy Agency of Nebraska." The report examines the Municipal Energy Agency of Nebraska (MEAN), which sells wholesale power to dozens of towns and cities in Nebraska, Wyoming, Iowa, and Colorado. Sustainable Development Strategies Group (SDSG), a non-profit research group based in Gunnison, Colorado, focused on the 13 municipalities in Colorado that buy power from MEAN. The report examines MEAN's power supply mix, policies, and contracts in the context of a transition to renewable energy. 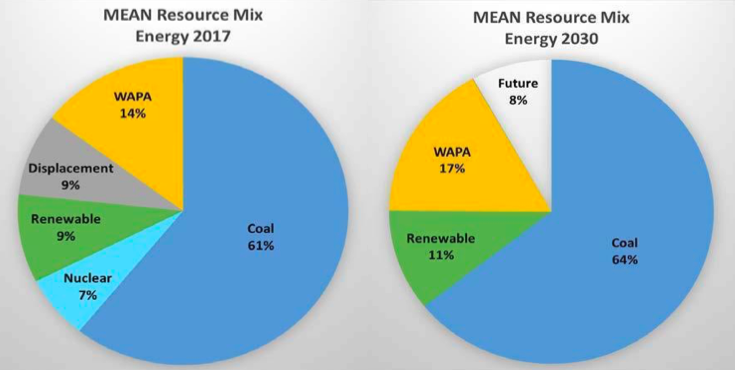 One striking finding in the SDSG report: coal accounted for 61% of MEAN's resource mix in 2017, according to its 2017 Integrated Resource Plan (IRP). And in contrast to major power suppliers for other Colorado towns and cities like Platte River Power Authority and Xcel Energy, MEAN expects that coal will remain a large portion of its energy mix, and even increase slightly to 64% by 2030. Tri-State Generation and Transmission Association has a new response for electric cooperatives that might be considering a different wholesale power provider: an advertising campaign that tells co-ops they are "better together" with Tri-State. But despite the message in the ads, Tri-State appears to have developed the ad campaign on its own, and is even placing the "better together" ads in the service territories of its members co-ops without explicit permission from the co-ops. Tri-State launched its new ad campaign as one of its member co-ops is seeking to exit its contract with Tri-State in order to pursue more local renewable energy projects and lower rates, while other Tri-State member co-ops are also considering other power suppliers. Last month, the Colorado Public Utilities Commission ruled that it would determine the amount Delta-Montrose Electric must pay to leave Tri-State. The discussion at one co-op's monthly board meeting suggests that Tri-State developed and placed the "better together" ads without the input of its member co-ops. At the Mountain Parks Electric monthly board meeting on February 14, Communications Manager Rob Taylor gave an update to the board of directors about Tri-State 's advertising campaign, so that the co-op could "discuss whether or not we want to use it." "Tri-State has started a new advertising campaign, and the theme is called “Better Together” and we have to discuss to decide if it’s the messaging we want. Currently our local messaging on our commercials are energy efficiency themed. But they have some radio ads that I wanted to share with you just so you could hear what their new message is. And again we have not started using this, but we have to discuss whether or not we want to use it." But after the Mountain Parks Electric board of directors listened to the Tri-State radio ad that ended with the message "Tri-State and Mountain Parks Electric. Brighter, stronger, better together," one board director said that he had heard the same ad on the radio that morning. One of Colorado's largest electric cooperatives is concerned that it could face higher rates in the future from Tri-State Generation and Transmission Association, because the wholesale power provider isn't paying down over a billion dollars of its debt, even as costs increase for its aging coal plants. ​In a letter to Tri-State CEO Mike McInnes, La Plata Electric Association CEO Mike Dreyspring raised concerns that Tri-State's debt could lead to increased future rates for the co-op and its members. In particular, the letter notes La Plata Electric's concerns about a portion of Tri-State's debt "for which Tri-State is receiving through rates principal and interest repayment, but is not applying the principal to reduce that debt." The Colorado Public Utilities Commission (PUC) ruled on Thursday that it has jurisdiction to determine how much Delta-Montrose Electric should pay to end its contract with Tri-State Generation and Transmission Association. The PUC ruling is a boost to the electric cooperative's years-long efforts to pursue more local renewable energy projects and try to stabilize electric rates for its members. “This is a significant ruling and confirms that no wholesale electricity supplier—not even Tri-State—is above the law. Tri-State talks about its ‘core principle’ of ‘voluntary and open membership’ in public. But its legal filings say that the Tri-State board can stop members from exiting by setting abusive charges with zero oversight." Three electric cooperatives in Colorado have now set clean energy goals, reflecting co-ops' growing recognition of the opportunities presented by declining prices for renewable energy and increased public support for wind and solar power development. The latest announcement came last week from Grand Valley Power, an electric cooperative that delivers electricity to more than 18,000 members mostly in Mesa County, Colorado. Grand Valley Power established a target of 60% clean energy by 2030, which the co-op described as "one of the most aggressive environmental targets of any electric cooperative in the nation." The ski industry is increasingly focusing its sustainability efforts on decarbonizing the electric grid, by engaging with their power suppliers, regulators, and state policymakers. In the latest move, a group of Colorado ski resorts are supporting Delta-Montrose Electric Association's efforts to end its contract with Tri-State Generation and Transmission Association and pursue more renewable energy. In a letter to the Colorado Public Utilities Commission (PUC) last week, Colorado Ski Country USA President Melanie Mills wrote that the group "supports the efforts of Delta-Montrose Electric Association (DMEA) to withdraw from membership in Tri-State Generation and Transmission Association, Inc. (Tri-State) in order to develop more local renewable resources and stabilize its retail rates." The letter also notes that of Colorado Ski Country USA's 23 member ski resorts, 16 buy electricity from rural electric cooperatives. Most of those co-ops buy wholesale power Tri-State, and so face limits on their abilities to pursue local renewable energy projects. That poses challenges for some ski resorts' sustainability efforts. Ski resorts also notice higher electricity costs, as the letter explains: "As businesses and large consumers of energy, keeping energy sources affordable is critical for Colorado's ski areas to operate cost-effectively in the future." The Colorado Public Utilities Commission today rejected Tri-State Generation and Transmission Association’s efforts to exclude the Colorado Energy Office from participating in the case between Tri-State and Delta-Montrose Electric Association. Delta-Montrose Electric has asked the Public Utilities (PUC) determine the amount it must pay to exit from Tri-State, while Tri-State has argued that the PUC does not have jurisdiction in the case. The Colorado Energy Office sought to intervene in the case earlier this month, noting that it can “intervene as a matter of right” under Colorado law. But the agency also acknowledged that its request came after a 30 day deadline, because the agency’s new executive director Will Toor took office on January 14. In response, Tri-State argued that the Colorado Energy Office should not be allowed to intervene in the case, in part by claiming that the state agency's "concerns regarding DMEA's rates and facilities" are outside of the PUC’s jurisdiction. Last week, a majority of Colorado state legislators urged the Colorado Public Utilities Commission (PUC) to determine the amount that Delta-Montrose Electric Association must pay to exit from Tri-State Generation and Transmission Association. In response to the legislators’ letter, Tri-State has sought to highlight the support from its member co-ops for its argument that the Colorado PUC does not have jurisdiction in the dispute. Tri-State spokesman Lee Boughey said in an email Friday that 34 of its member cooperatives have filed statements supporting the position that the state utilities commission doesn’t have jurisdiction in the contract dispute. Tri-State spokesman Lee Boughey said that 34 of Tri-State's members, or 80 percent, have made filings with the PUC in support of its position that the DMEA issue is not up to the PUC to decide. "Legislators should be aware that the vast majority of our members disagree with DMEA, and in fact have intervened on Tri-State's behalf at the PUC. We would encourage legislators to reach out to the co-ops in their districts for feedback when they're asked about these kinds of matters," Boughey said. A majority of Colorado’s state legislators are urging the Colorado Public Utilities (PUC) to determine the amount that Delta-Montrose Electric Association must pay to exit from Tri-State Generation and Transmission Association. We submit these comments in support of the filing last month by Delta-Montrose Electric Association (DMEA) asking the Colorado Public Utilities Commission to set a just, reasonable, and nondiscriminatory charge for DMEA’s exit from Tri-State. As members of the Colorado General Assembly who care about rural economic development and allowing all Coloradans access to less expensive power from local and diverse generation sources, we urge the Commission to strongly consider exercising its jurisdiction under Colorado law and setting an exit charge fair to both DMEA and Tri-State’s remaining members. More corporate customers want renewable energy options. What happens when an electric utility can’t offer that? United Power has been meeting with other electric cooperatives this month, in an effort to build support for its proposal to change the bylaws of its power supplier, Tri-State Generation and Transmission Association. Those meetings follow United Power’s invitations to discuss its “grave concerns about key elements of Tri-State’s key generation products and services” directly with the 42 other co-ops that buy power from Tri-State. At a presentation to Mountain Parks Electric on January 3, United Power New Business Director Jerry Marizza explained that United Power was not proposing to simply raise the 5% limit that Tri-State imposes on local renewable energy development to a higher level. Instead, the proposal for a partial requirements contract option would assure that Tri-State continues to provide a portion of United Power’s energy purchases, while allowing United Power to meet its electricity load growth by pursuing its own local renewable energy projects, or buying wholesale power from other providers. The Ikea store in Centennial, Colorado has a 1.1 megawatt rooftop solar array. Colorado Governor John Hickenlooper announced this week that John Gavan will serve as the next Commissioner of the Colorado Public Utilities Commission (PUC), beginning January 7, 2019. Gavan will replace PUC commissioner Wendy Moser, whose term ends next month, and join Commissioner Frances Koncilja and Chairman Jeffrey Ackerman, whose terms continue until January 2020 and January 2021, respectively. "We appreciate Wendy’s service to the PUC," said Hickenlooper press secretary Jacque Montgomery in an email, "Mr. Gavan was a consensus choice of both the Governor and Governor-elect Polis. He is an engineer and brings experience in energy and telecommunications. We believe Mr. Gavan will be an excellent addition to the PUC." The Colorado PUC regulates electric utilities in the state, and will likely play a significant role in efforts to shift the state toward renewable energy. Governor-elect Jared Polis campaigned on a goal of moving Colorado to 100% renewable energy by 2040 or sooner, and said after the election that goal will be among his top priorities. The Polis campaign website highlighted the importance of “Appointing Public Utilities Commissioners who support consumers and renewable energy” among the ways that "We can spur investment in new local renewable energy projects." United Power will dedicate the largest battery storage system in Colorado next week, a 16 megawatt hour Tesla Powerpack in Longmont that the electric cooperative expects will save its members $1 million each year. But recent policy changes by Tri-State Generation and Transmission Association, United Power’s wholesale power supplier, aim to discourage other cooperatives from pursuing similar projects, creating uncertainty for the deployment of battery projects in much of rural Colorado and New Mexico. United Power shifted its focus to battery projects last year, after the co-op reached the 5% limit on local renewable energy generation imposed by Tri State. Over the past several years, United Power sought to reduce its purchased power costs by building several solar arrays in its service territory that deliver power at a lower cost than power sold by Tri-State. Blocked from pursuing more local solar projects, United Power developed a strategy to use batteries to help control its peak demand. Last month, United Power also wrote to other co-ops expressing "grave concerns" about Tri-State, including the high cost of power it sells to member co-ops and "Tri-State’s reluctance to embrace additional sources of renewable energy generation due to constraints of its largely fossil fuel generating fleet." Controlling peak demand will help the co-op manage its purchased power costs - which could slow the growth revenue that Tri-State receives from United Power. So this past summer, Tri-State changed its Policy 115, which describes how the 5% limit will be implemented. Tri-State inserted language into the policy to include “energy storage devices, such as batteries,” even though the policy was designed to deal with co-ops’ renewable or distributed generation projects. A June 2018 copy of the proposed changes to Tri-State Policy 115 shows the edits to the policy in red, before those changes were finalized. Delta-Montrose Electric Association (DMEA) took a major step forward in its effort to end its contract with Tri-State Generation and Transmission Association, by filing a formal complaint last week requesting that the Colorado Public Utilities Commission (PUC) "exercise its jurisdiction over Tri-State as a public utility" and "establish an exit charge that is just, reasonable, and nondiscriminatory." On Monday morning, the Colorado PUC ordered Tri-State "to satisfy the matters in the complaint or to answer the complaint in writing within 20 days." On Monday afternoon, DMEA filed a request that the PUC establish a schedule for the hearings process that would result in a decision by July 11, 2019. DMEA has sought for years to loosen the restrictions that Tri-State imposes on electric cooperatives, which prevent DMEA and other Colorado co-ops from pursuing more local renewable energy projects. In October, DMEA members voted to give the electric cooperative more financial options to pursue a buyout of its Tri-State contract. DMEA noted in a press release that it "will partner with Guzman Energy," the same power supplier that supported Kit Carson Electric's $37 million buyout of its contract with Tri-State. Guzman Energy announced today that it is seeking Requests for Proposal for up to 200 megawatts of wind energy and 50 megawatts of solar energy, and has obtained a $200 million capital commitment to help bring on that new renewable energy. Guzman Energy President Chris Riley confirmed that a portion of the 250 megawatts of wind and solar would be used to serve DMEA, if the co-op succeeds in ending its contract with Tri-State. United Power, the largest electric cooperative that buys power from Tri-State Generation and Transmission Association​, is seeking changes to Tri-State's bylaws that would give more flexibility to United and other co-ops to purchase power from other providers. In letters sent last week to the other electric cooperatives that buy power from Tri-State, United Power board president James Vigesaa wrote that "the Board members and management of United Power have grave concerns about key elements of Tri-State’s key generation products and services," including Tri-State's reluctance to embrace renewable energy and the high cost of power it sells to member co-ops. A United Power representative said that letters were sent to the board presidents and general managers of each of the 42 other Tri-State member co-ops. Other electric cooperatives in Colorado and New Mexico have noted similar concerns about the high cost and heavy reliance on coal of the power they purchase from Tri-State, and have responded in a variety of ways. In September, Poudre Valley Electric Association urged Tri-State to study if adjusting its fuel mix could lower costs, as reports from Rocky Mountain Institute and Moody's Investors Service have found. Delta-Montrose Electric Association is pursuing an end to its contract with Tri-State, as Kit Carson Electric did in 2016. La Plata Electric Association is studying its options, and last month contracted with three consulting firms to analyze its contract with Tri-State and other power supply options. United Power's letter suggests another approach: instead of only allowing all-requirements contracts, which require each co-op to purchase 95% of its power needs from Tri-State, United Power's proposal would "amend the Tri-State bylaws to include a partial requirements membership relationship." At the Clean Energy Means Business Summit in Denver this week, representatives of municipalities and companies in Colorado discussed how they are pursuing their renewable energy goals, including navigating the challenges and opportunities of working with electric cooperatives in Colorado. The event, organized by the Colorado Solar Energy Industries Association and the Compact of Colorado Communities, also included presentations from solar energy developers, electric utilities, and state officials. We’re still working through many different negotiations with many of our co-ops. Each one of our locations we operate in has a unique mix of renewable energy sources and possibilities, we have a co-op for each one generally, so we look at everything on a case by case basis. Is there anything in particular you plan on prioritizing? Certainly, saving families money on health care, expanding access to preschool and kindergarten, and taking the steps to move toward more renewable energy will be among our top priorities both through executive actions as well as working with the state legislature. At the 2018 Colorado Rural Electric Association Energy Innovations Summit this week in Denver, electric utility industry officials discussed changes in energy technologies and utility business models, such as increasing customer choices and declining costs of distributed renewable energy. But while there was broad agreement about the opportunities provided by cheaper renewable energy, there were disagreements about the scope and pace of business model changes underway in the industry - and the implications of those changes for the hundreds of electric cooperative directors and staff attending the conference. What choices do customers have other than buying from you, all that that they have ever bought? Do they have choices? Yeah they have choices. Primarily distributed energy resources. But we’re not just talking about rooftop solar, we’re talking about a whole variety of options that they have to reduce the amount of electricity that they buy from you.